Immersive Soul Journey to Your Personal & Professional Evolution! 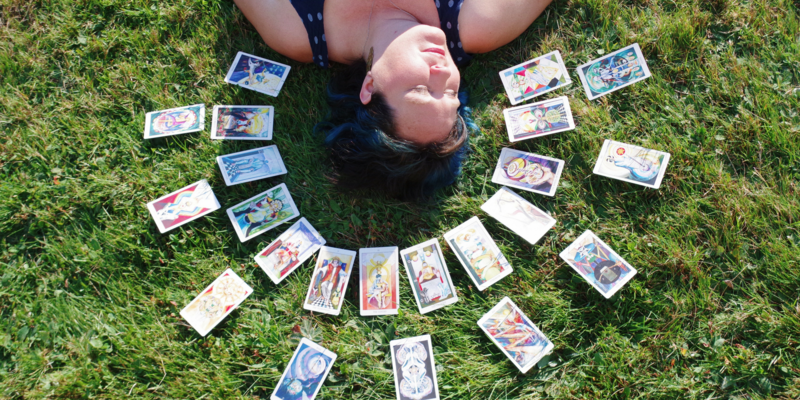 This tarot apprenticeship is an in-depth, intimate, co-created, community experience! We live in times where knowing and loving who you are is absolutely necessary to stepping up and doing compassionate work in the world. Tarot helps you expand, grow and heal. Nurture your spirit with this enriching, unfolding and insightful tool. This simple deck of cards holds keys to the very depths of your soul. Step into a bigger picture of your life! Whether you are a healer, coach, alternative health practitioner, teacher, energy worker, or want to use the tarot in your personal spiritual and creative practice, the work you do in this school will increase your confidence and self-mastery in your life and the lives of your clients. Working with tarot is a beautiful act of integration, self-care, and soul healing. It’s truly a light in the dark! More than a Tarot School! 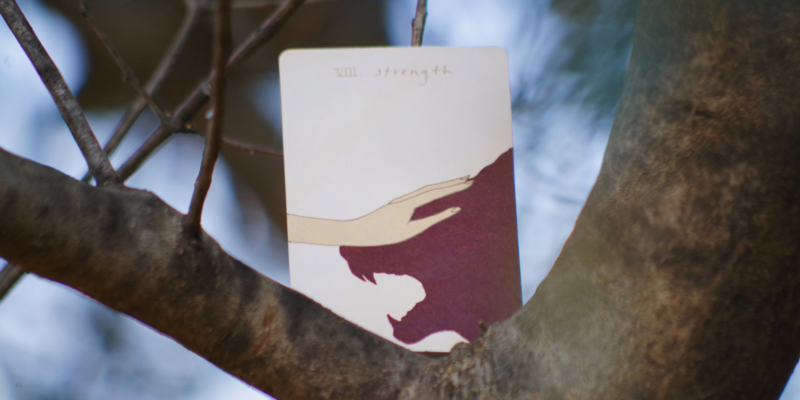 Sage Intuitive Tarot School is founded on the principle that tarot is an initiatory practice and healing tool that serves to deepen your connection to yourself and others. Tarot is a tool for profound change, and in this evolving world, it facilitates personal and social growth. I have personally found tarot to be a refuge and a reliable mirror. Tarot is a complete system for true intimacy and compassion. What I’ve learned from years of guiding hundreds of tender souls through immersive and year-long transformational programs over the last four years is that when you know and accept all of who you are, you become a great and loving vehicle of service in the world. You will find, with consistent practice and a commitment to our community container, that you grow in confidence and strength. You are choosing to shift your perspective and serve all you come in contact with. You can use tarot in workshops, courses, and circles. It’s also an extremely useful mentoring and coaching tool. You may also want to read tarot professionally, and this school will help you increase your skills as a reader. 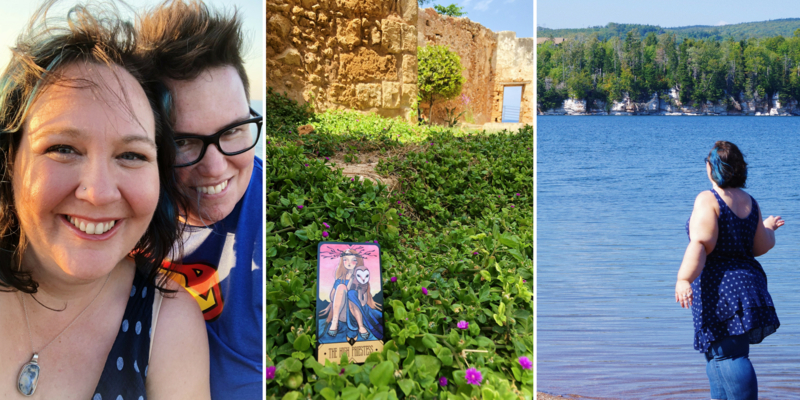 It’s extremely important to me that tarot is used responsibly and ethically with clients, and by the end of the program you can be confident that you’re practicing in ways that truly help empower people. Tarot is a tool that you can use to access your inner wisdom and intuition every day. Use it to spark dialogue and creativity, plan projects, and seek divine guidance. On a soul level, tarot is a portal to your higher consciousness. A practical way to create magic! Tarot is a growing industry and is becoming embraced in the mainstream. More and more people from all spiritual and secular belief systems use tarot for guidance. My approach is non-dogmatic and open to everyone. I go to the cosmic astral planes and am very down to earth at the same time. I encourage you to get curious while always trusting your own inner authority above all else. I believe in the importance of legitimizing this incredibly beautiful magical system. In the school, you will learn how to trust the intuitive messages you receive and clearly relay them to others. Intuitive knowledge is just as valuable as other ways of knowing. At the Tarot Intuitive Level, you’ll form a deep relationship with your deck, learn to quickly and confidently access your intuition. 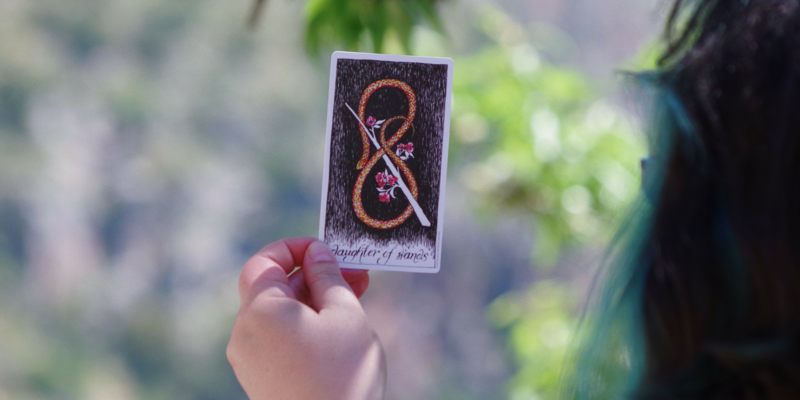 You’ll meet every card in the deck and create daily, weekly and monthly tarot rituals and ceremonies! 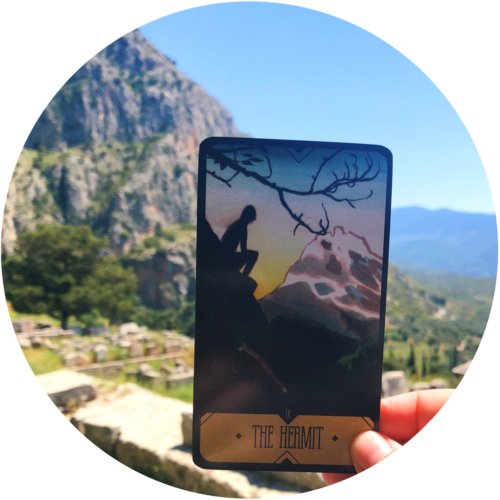 Whether you are completely new to tarot or have been reading for years, embark on a healing journey to find practical ways to use this beautiful tool in your life! On the Threshold: Orientation. Introduction to the program, the tarot system, a brief history and how to choose your deck. Gateway One: Enter Your Tarot Sanctuary. Get to know your deck, develop everyday rituals, cultivate your intuition and read for yourself. Gateway Two: Step into a Portal to Higher Consciousness. Explore the Major Arcana card by card. You will be introduced to the Rider Waite Smith system and learn to apply it in a modern context. You’ll look at every card and explore its essence both upright and reversed. Gateway Three: Telling the Story. Advanced tarot interpretation methods, multi-card spreads & card interactions. Gateway Four: Dive into the Everyday Soul Magic of the Minor Arcana Part 1 – Spirit and Emotion. Meet the initiatory firey wands and learn to hold the vessel of the emotional realms. 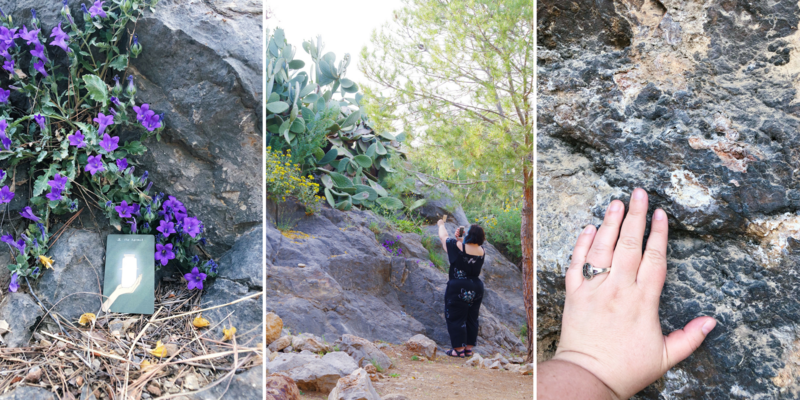 Gateway Five: Dive into the Everyday Soul Magic of the Minor Arcana Part 2 – Intellect and Physical Body. Learn to work with your windy mind with the swords and manifest in your life with the pentacles. Gateway Six: The People. Develop strong compassionate relationships with yourself and the people in your life as we explore the court cards. 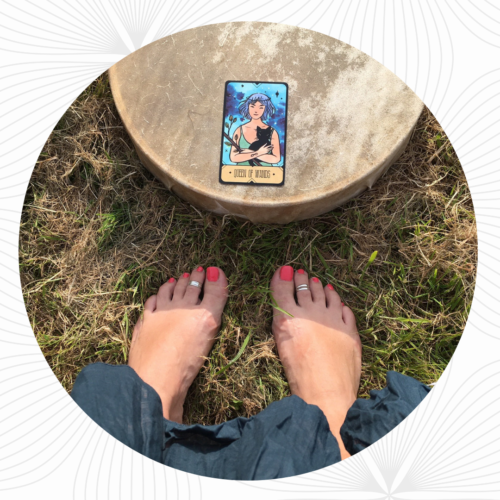 At the Tarot Soul Guide Level, you’ll take your grounded and experiential knowledge of the cards and apply them to even deeper work. Here, you’ll dance with shadow, breakthrough challenging patterns, dive deeper into tarot history and practice oracular techniques all while finding your own unique voice! Gateway One: Tarot and the Dark Night of the Soul. Dance with shifting shadows, learn deep listening skills and journey to the realm of the soul. Gateway Two: Tarot and the Otherworld. Explore shamanic journeying techniques as you connect with your guides. Gateway Three: Be An Oracle. Learn about the ancient oracle tradition and bring the wisdom back to others. Gateway Four: Honoring the Ancestors. Introduction to the Thoth and Marseilles systems. As always, you’ll learn to apply them to modern contexts. Gateway Five: Transformational Tarot. Breakthrough challenging patterns, vision new possibilities, and guide others to do the same. Gateway Six: Make Tarot Magic. Create your own tarot ceremonies and work with the seasons. At the Tarot Healer Level, you’ll further develop your craft as you learn to facilitate healing for yourself and others. You will learn techniques to clearly deliver insightful messages while taking care of your energy body and providing true value to others. You’ll also explore the rich and exciting landscape of alchemy, mysticism and the Kabbalah as you enter the temple of the soul. You do not need to charge for services in order to take part in this level. May the work you do be a healing ripple in the world. Gateway One: Tarot and the Healing Journey. Enter the cosmic realms and work with your energy body. Learn energy protection, how to take care of yourself, stay in the flow, and maintain personal boundaries. Gateway Two: Alchemy & Mysticism. Explore the Western Mystery tradition and learn the ways symbols, astrology and the Kabbalah can impact your readings. Gateway Three: Creative Tarot. 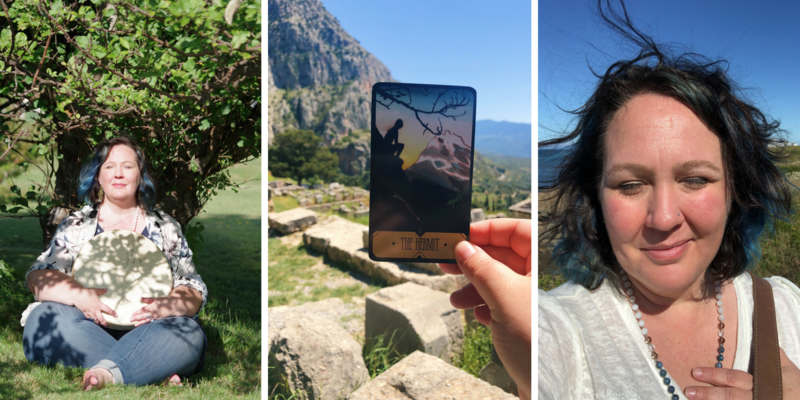 Explore fun and creative ways to bring tarot into your life! Gateway Four: Clear Communication. Develop confidence as an intuitive reader, increase your skills in holding a compassionate and caring space, and practice vulnerable and honest communication. Gateway Five: Ethics and Exchange. Reading for others: ethics, consent and exchange. Gateway Six: Sharing Tarot Leadership. Bring tarot to your outer world and contexts. 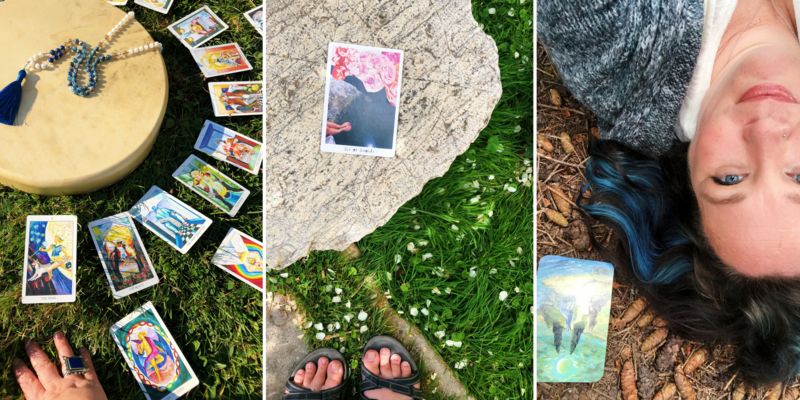 This gateway explores how tarot can be used as a tool in teaching and mentoring. **Please note: Gateway topics for all three years are subject to change based on the needs of the group. Give Yourself the Gift of Time to Integrate Your Knowing! Each year includes Six Gateways. In each gateway, you’ll engage in a comprehensive combination of videos, PDFs, and participatory teaching calls. 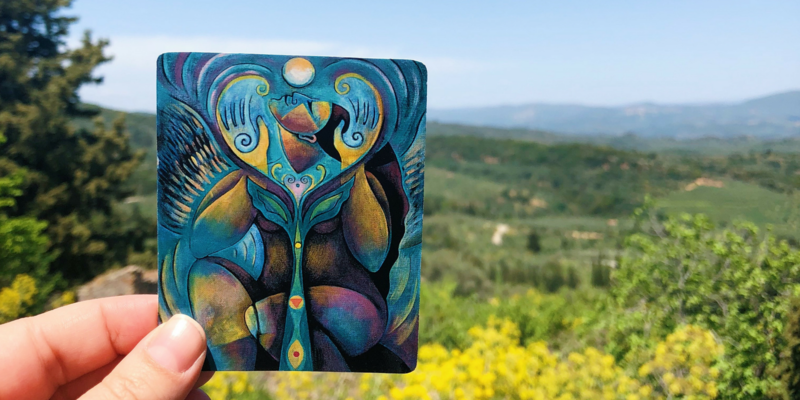 In the pause between each gateway, you’re invited to deepen into your tarot practice with the support of your community. You’ll be given clear instructions as you make progress through each gateway into the subsequent level. This program builds upon itself and requires your strong commitment to the process as we hold the container for you. I’ve been guiding groups through year programs for a long time, and am highly skilled at supporting people through deep transformations with ease. I’m an engaged and gentle leader with strong boundaries. You will get to know each other. The community truly lifts each other up in love and joy. My partner Stacy and I hold the community space together. We are committed to building an enriching, conscious and thriving community based on the principles of love, light, compassion, kindness and respect. This group will only be open to a limited number of people so that we can give you our attention and care. We show up for you! Video Lessons to further enrich your learning. Beautifully designed PDF Workbooks that walk you through all the lessons. 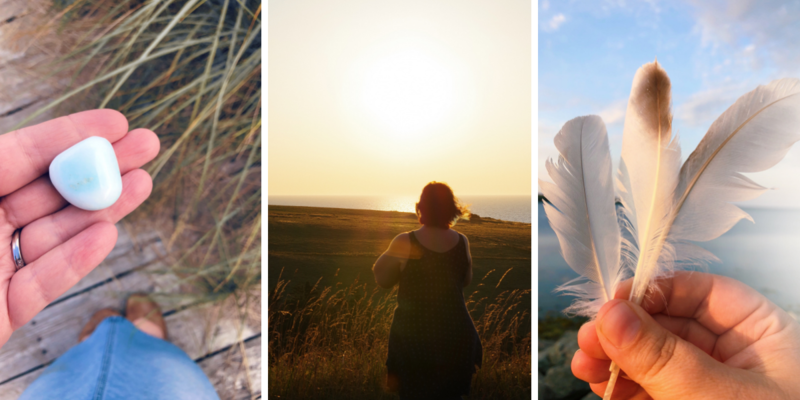 Intuitive Practices to increase your intuitive confidence and skill. Spreads to help you work with and integrate the material. TWO Live Participatory Teaching Community Calls. Gateway content is delivered at the beginning and middle of each month. Gateway months are January, March, May, July, September, November. In the pause between each gateway, you’ll be given clear instructions to support your deepening tarot practice. Private Members Area and Discussion Group. Gateway months are January, March, May, July, September and November. Thoughtful feedback is given on the Assignments you complete at the end of each Gateway. These structured check-ins help keep you on track and integrate the material. 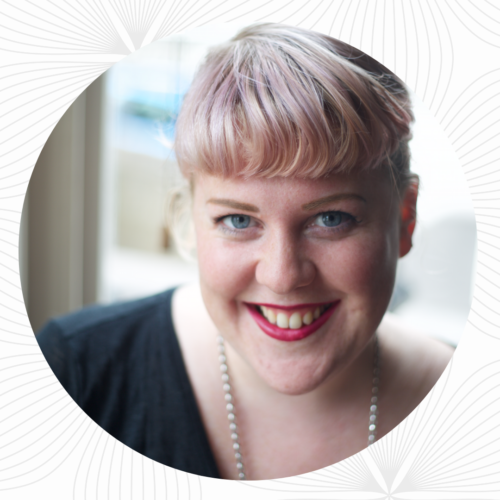 Exclusive Mentoring Rates for support in honing your craft, reading for others, and working with tarot professionally. During the school, I’m here to support you every step of the way and give you gentle accountability. May this be a renewing, deep, rewarding and transformative experience for you! “I have been waiting for a course like this for quite some time now and I was so thrilled that Vanessa put this offering out into the world. The course has taken me on a deep journey within and I have learnt so much about the tarot and about myself along the way. I can see how my intuition and the messages have deepened over the course of the year. And it is so magical how things start making sense from a day to day level and beyond. 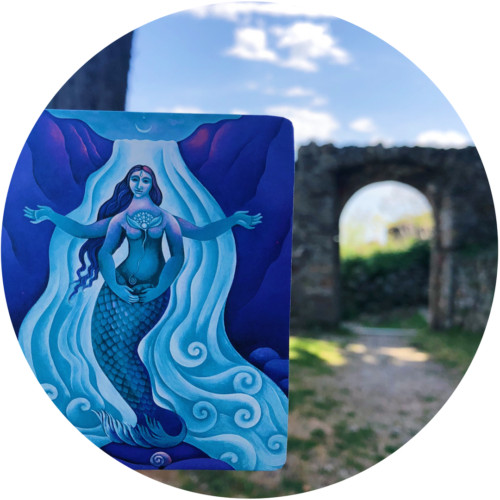 In a short period of time, Sage Intuitive Tarot School has given me an awareness and appreciation of the background and history of Tarot and a growing understanding of the symbology that has removed any fear that I had around tarot. The class material is presented in a clear, accessible and engaging way with videos and our monthly community call. I really enjoy the engagement in our Facebook community, especially hearing from Stacy as she takes this journey with us too. It is encouraging and heart-warming. 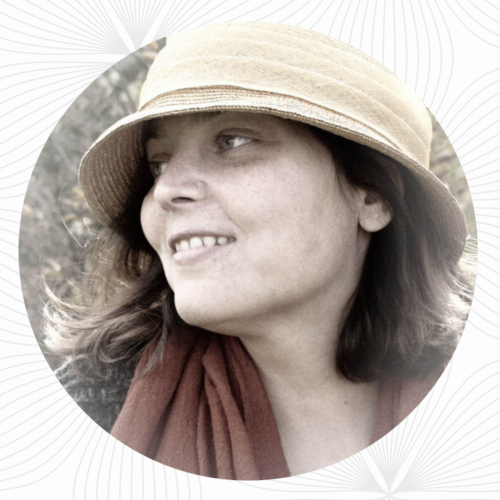 Hi, I’m Vanessa Sage, Ph.D., and I’ve been immersed in tarot and women’s spirituality for over 25 years! I’m a Priestess, a spiritual business mentor, and a poet. I have a Ph.D. in cultural anthropology from McMaster University. Over the course of my 10-year academic career, I studied: Buddhism, goddess spirituality, pilgrimage, paganism, and how hope for a city was embodied in an arts scene. I bring my whole heart, mind and spirit to the table. 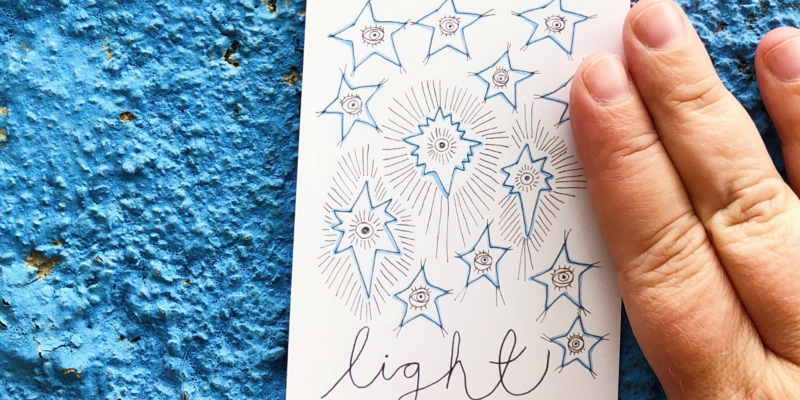 I read tarot professionally, and over the last 7 years, I’ve trained as a life coach, taught insight meditation, and led heart-centred business classes for Jennifer Lee of the Right Brain Business Plan. I’m a highly sensitive introverted empath. Tarot is a 78 card deck that has been around since at least the 15th century. It was most likely first used as a card game and later developed into a divination tool. It is divided into the major arcana and the minor arcana. 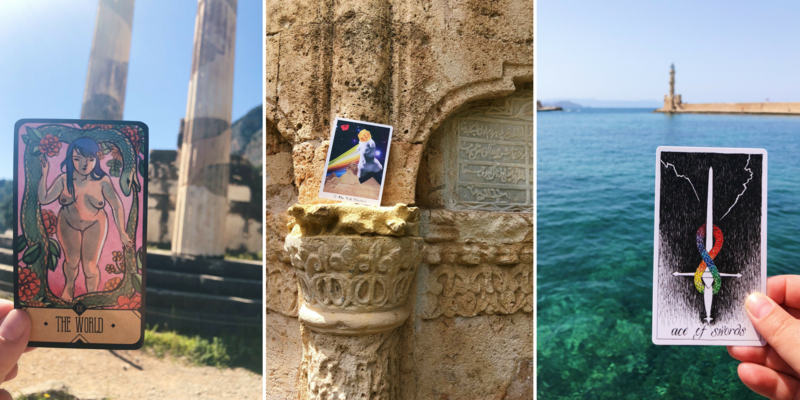 The major arcana consists of 22 cards and represents your soul’s journey and archetypal lessons you learn over the course of your life, while the minor arcana helps you understand & explore your everyday life. 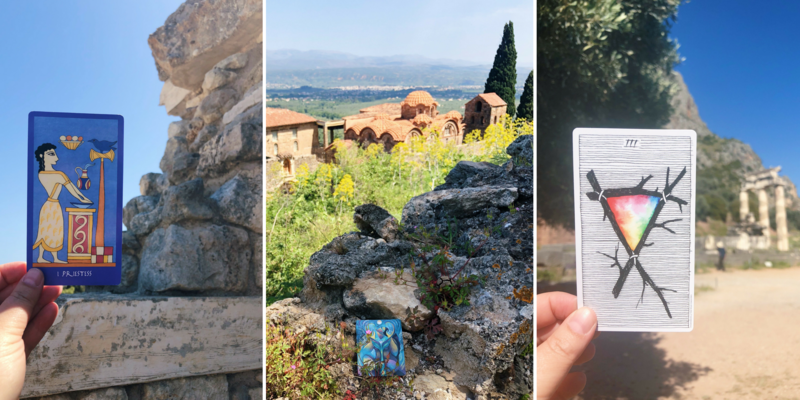 Today, interest in tarot has exploded, the industry is expanding in very exciting ways, and the possibilities are endless for how it will be used in the future. Tarot is a great business, personal and spiritual tool. It is adaptable to any interpersonal, community and service work you’re doing. 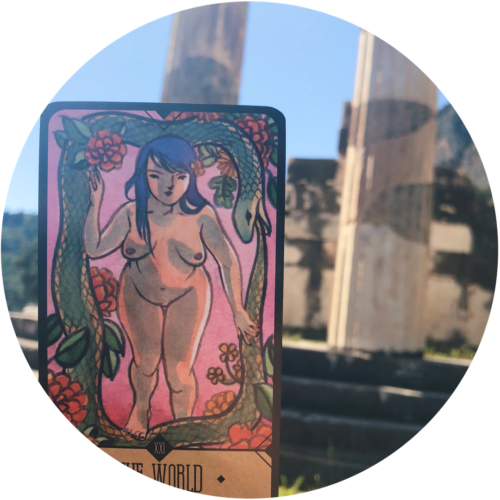 Now is the time to be part of this amazing tarot world! Tarot came into my life as a child when a family friend pulled out his Rider-Waite-Smith deck after a dinner party. This was before computers or the internet, and I’d never seen anything like it. I was hooked with the very first card: the Fool! The well-worn deck felt like a portal. A way to step into the unknown. In high school, I found my first deck in a dark, tiny, out of the way shop filled with books, crystals, cards, and incense. I choose the Hanson Roberts deck, and it still holds a very special place in my heart. Since finding my first deck, I’ve spent over 25 years studying, working with, and reading tarot for myself and others. I love imagining new ways we can use this amazing tool! 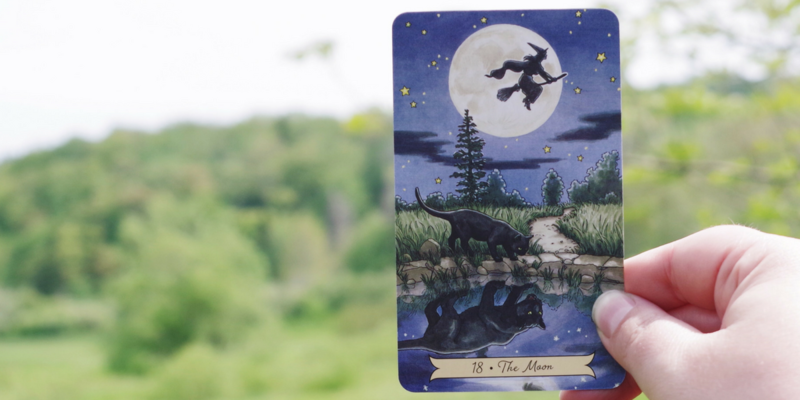 When I first started drawing cards for myself I was comforted by the truth I saw reflected back at me. They weren’t telling me everything was fine when it wasn’t but they did show me that I wasn’t alone. They mirrored what I was afraid to say out loud & gave me boundless possibilities for my life. What do you believe is possible this year? I pretty much wake up each day and go to sleep each night thinking about tarot. I’m fascinated by the history and meanings of the cards. More than that, I’m passionate about how to let it all go and receive intuitive messages from my soul. Follow your intuition every step of the way. How much time will I need for the program each week? This program is designed to be very gentle with a soft pace while still guiding you through a comprehensive process. Schedule an hour or two a week for the live calls and pre-recorded video, audio and pdf content. During the program, you’re asked to develop a personal practice that works for you (daily or weekly). This can take anywhere from 5 minutes to longer depending on how much you want to do. What if I need to leave the program before it's over? Program is non-refundable once you choose to enrol. By registering with a monthly plan you are making a commitment to complete all payments. However, we do understand that circumstances may arise that prevent you from being able to do so. If you find yourself needing to withdraw, there will be no financial penalty but also no refund. You will need to begin again with a new group if you want to rejoin. It’s important for the nature of this work that you set the intention to complete the program. Send us an email if you have any questions before enrolling and really check in with yourself and see if you can make the commitment to the program at this time. May this be a renewing, deep, rewarding and transformative experience for you! What if I don't have any tarot experience? That’s perfect! When working with intuition, a beginners mind is so powerful! No previous tarot experience is required. We’ll go through everything you need to know to get started in the first month. I'm very experienced with Tarot, read professionally and have been using it for years. Will this program be right for me? Absolutely! Thank you for being here. I am so honoured to work with you and stand side by side with you on this journey. I don’t know about you, but I find that there’s always more to learn and explore with the tarot! It’s been a lifelong passion for me and I imagine the same is true for you. All experience is valued and I am invested in every single person who is part of the program. You are very welcome here. I can't even imagine next week let alone three years from now. Should I still register? I completely understand. It’s a big deal! Only you can know if this is a good fit, and I encourage you to really look within and see how it might feel three years from now having done this training. How does it feel in your body? Ask yourself if you think you’re still going to be curious, interested and passionate about spiritual, personal and creative healing using the tarot? If you’ve read this far, my bet is YES! I never thought I’d still be learning about tarot 25 years later but I am. …and honestly, I can’t wait to take this course with you! It may also help to know that I’ve been running year-long programs for over four years and many many people are still in the community all those years later. There is something incredibly special about witnessing each other’s lives unfold over time. This is more than a tarot program. What deck should I buy and how do I choose? You will need at least one for the course. This deck should be one you love to work with. Deck suggestions will be made right away. For the first two months you will need only one deck: your favourite deck or the deck you’re most drawn to. In the rest of year one, it will be helpful to have a Rider-Waite-Smith deck or clone. In year two, you may want to get Thoth and Marseille study decks. You’ll also be invited to keep a tarot journal. Can I ask questions on the calls? Oh my goodness, yes! When we meet as a group LIVE on Zoom I’d love for you to participate. I’m a very interactive teacher and the calls are held in a loving safe and fun space. We will be alternating between weekdays at noon or 3:00 pm Eastern Time (New York) and either an evening or weekend call to meet the needs of both our international community and those who work full-time during the week. All calls are recorded if you can’t make it! Will we be learning all the meanings by heart or read intuitively? We’ll be doing both! You’ll get some orientation on the tarot system right away and then we’ll be putting the books down for the first gateway. We’ll then start looking at the meanings of the cards! You don’t need to learn the meanings by heart but you may want to have some knowledge of the meanings to help support you. I’m a kind of learn the rules so you can break them kind of reader! Is this for me even if I don't want to become a professional reader? Both the community level and the professional level are designed to work for you in the ways you need them to. There is no need to become a professional reader at all. Of course, if you do read professionally, you’ll receive plenty of support. Whether you’re on a personal, spiritual, creative, or professional path, you’ll find something here for you. The retreats and pilgrimages will be open to anyone enrolled in either tarot school and priestess training first. We will then open them to the larger community if there is still space. Our intention is to start offering at least annual pilgrimages in places such as Nova Scotia, Greece, Glastonbury and Malta. I'm in Priestess Training as well (or plan to be). How does being in both programs work? I’m so very honoured you are considering taking Tarot School as well. They both work with an ebb and flow model: concentrated training one month followed by pauses to integrate the next. The pauses will be at the same time, which will be such a beautiful way to work within both programs. It will mean a couple of extra calls a month with lots of space in between. Many people take both programs and love them. I do hope you’ll join us! Do you have other policies I should be aware of? I do! You have lifetime access to all pre-recorded video, audio and pdf content. The pre-recorded teaching videos and pdfs are downloadable. It is your responsibility to download anything you’d like for use outside the learning platform. Content may be updated (re-recorded or re-written), added to, corrected or generally improved at any time. Currently, all material is housed in Teachable. While we don’t anticipate moving the content, we reserve the right to move the content to another platform during the program. Our LIVE Community calls are recorded but are not downloadable. The live community calls will be archived six months after the completion of the program in 2022. The live community calls are only available to participants in the January 2019-December 2021 program. We agree, as a community, not to share the recordings with anyone outside the program without the express permission of all involved. Non-community portions of the live calls (i.e. teaching only portions) may be edited out and made available to future students. If you leave the program before it is over, you will be immediately removed from the learning platform and the FB group. Further, you forfeit your access to all past and future material in the current January 2019-December 2021 program. You would be required to begin again with a new group if you want to rejoin. Minimum enrolment is required to run each year of the school. In the unlikely event that a year is cancelled due to enrolment or serious injury/illness, no refunds would be given for past content that was delivered. However, your future payments would be immediately cancelled. Further, you would still have access to the material covered to date (lifetime for pre-recorded video, audio and pdf content and six months for community calls). Not at all! I work with women, men, and trans. I hold an inclusive and open space for fluid gender expressions and am LGBTQ positive. Disclaimer: This work is spiritual and intuitive in nature. I do not promise any cure and this program is not intended to be a replacement for licensed medical care or prescribed therapies. Please follow the advice of your doctors and counsellors for all medical treatments, prescribed remedies and for any and all mental health, physical health and emotional health problems. All photos are my own and were taken by my partner Stacy Maskell or myself. Photo Locations: Cape Breton, Canada. Delphi, Epidavrous, Nafplio, Eleusis, Mystras, Chania and the Palace of Knossos, Greece. 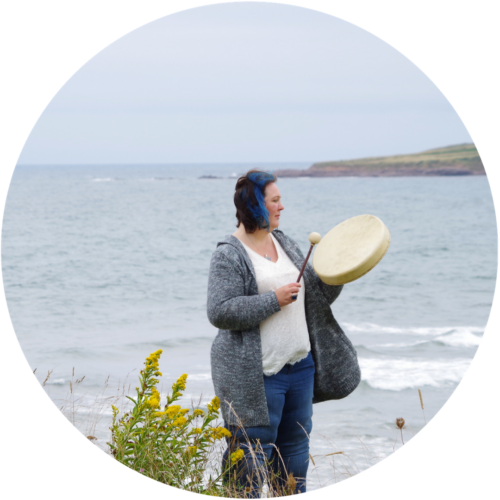 The drum pictured was made for me in a Celtic European tradition and this is how I use it. Decks Pictured: Sasuraibito Tarot, Mesquite Tarot, Wild Unknown Tarot, Tarot of the Spirit, Triple Goddess Tarot (trimmed), Minoan Tarot, Vessel Oracle, Everyday Witch Tarot, Lioness Oracle Tarot, The Druidcraft Tarot (trimmed) I highly recommend all of these decks.